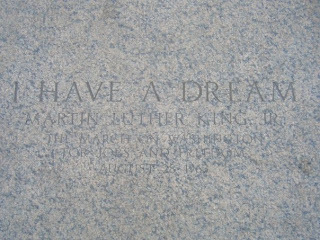 While listening to npr this morning, I heard a really great news cast on Martin Luther King Jr. 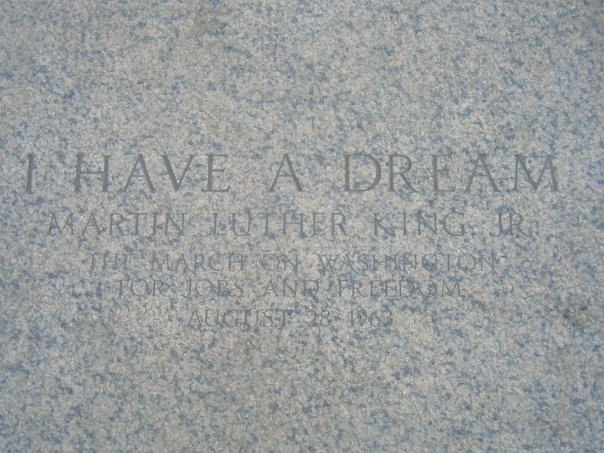 It took me back to when I went to DC for the fourth of July in 2008 and got to stand where Martin Luther King stood and gave his "I Have A Dream" speech. It was so empowering to stand in front of the Lincoln Memorial, looking over The Mall and imagining being there. I have imagined myself as Martin Luther King Jr., telling the country that I dream of the day when my children are judged not by the color of their skin but the content of their character. Having grown up with racism being a huge part of my life, I know what it feels like to have people judge you by the color of your skin. I know the feeling of being told you are a terrible person because of your beliefs. Because I know how that feels, I don't want to ever impose those feelings on someone else. I want to fight racism in all of it's forms, against all the people of the world. We should take pride in being human and unite as such. I love that the world is diverse and is full of people with all different skin pigment variations and the cultures that are associated with them. But I don't want to put people in a corner because of their skin difference. Over the past few months I have come to realize that the only way anything to change in this world is if everyone wants it to change. We have to unite for change to make it happen. I want to see that change happen with my generation and future generations to come. Lets make every day MLK day. 25? Why are you not married?